Sherlock Holmes is one of the most recognizable characters in English culture. The original books by Sir Arthur Conan Doyle have been selling like hot scones with clotted cream for more than a hundred years. Holmes has spawned movies, television series, novels, and games. A significant burden for anyone creating a Sherlock Holmes game is the obligation to at least attempt to live up to the Sherlock Holmes Legend. This means accurately portraying the great man’s quirks and near-clairvoyant observational skills, while creating an authentic Sherlock Holmes setting – Victorian interiors, the streets of London, drafty country houses, nefarious foreigners, anxious maidens, wily street urchins, plenty of rain.... Add to that a mystery full of hints and twists worthy of the tradition of Holmes. Does Sherlock Holmes: The Case of the Silver Earring sustain this expectation? Take for example, the ambiance of 221b Baker Street. We find a colorful Victorian interior, pipe and slippers on a low table, violin near the hearth, and everywhere the sounds of carriages in the London streets. The locations in Silver Earring are colorful and superbly realized. They create a world that is wistful, elegant and surprisingly real. As for the character of Sherlock Holmes himself: this Holmes is handsome, aloof, and disciplined. He possesses a fantastically honed intelligence. His conversation is seasoned with a dry, sarcastic wit. His sole shortcoming is that he lacks the panache of Jeremy Brett’s Holmes (with whom it is impossible NOT to compare this Holmes –- even though this one is computer-generated). The game’s story is tightly scripted. In classic style, the murder victim has been treading on enough toes to create plenty of suspects. The crime seems physically impossible for anyone to have committed except for the prime suspect, who appears to be incapable of such an act. So much innocence, so much beauty, such fabulous wealth…. Silver Earring is a point-and-click adventure in which you play as both Holmes and Watson. If you’ve played Journey to the Center of the Earth (JTTCOTE), you will recognize the interface. Clicking in the general direction you wish to go will usually cause your character to move in that direction. When you see the footsteps icon, clicking will take the character to the next “authorized” spot. Double-clicking makes Holmes or Watson run. Many of the frustrating movement issues in JTTCOTE have been resolved in Silver Earring. Still, there were occasions in which Holmes seemed to get “stuck” and I had to click around in every direction before “un-sticking” him. Right-clicking brings up the inventory bar. Throughout the game, Holmes’s tools of the trade (a magnifying glass, measuring tape and test tube) are in inventory. These are frequently used. Inventory also includes a notebook, which is essential to understanding the game. The notebook has transcripts of the witnesses’ conversations (thankfully, only the important bits). Also, the notebook contains documents and an analysis of the physical evidence. As Holmes, you spend time searching for important clues, most of which the bumbling police force will miss. Items are at least partly visible, though some don’t become “hot” until an action in the game triggers them. You also analyze various clues using Holmes’s desktop laboratory. The lab in Silver Earring is much more entertaining than similar challenges I've encountered in other Sherlock Holmes games. There is a test at the end of each chapter that sends you back into the notebook to look for evidence. At first I thought, “What? Is this SCHOOL?” However, not only was it fun to take the tests, but they significantly clarified the investigation. There are cutscenes in the game that draw plot threads together. One in particular –- the business with the dominoes –- was extremely effective. Character movement is a trifle stiff and, curiously, Holmes seems to open doors without touching the knobs. But facial expressions are life-like, especially those of Watson, whose eyes are unusually animated (perhaps too animated -- as he occasionally looks cross-eyed). More than any other mystery game I’ve played, Silver Earring builds a complete portrait of the murder victim. You witness his life as it is reconstructed bit by bit, with all its contradictions and complexities. By the end, a man whom you see alive for about one second has become an overriding presence in the game. Unfortunately, there are a few places where Silver Earring gathers up all its good qualities and packs them on ice. For me, what was an impetuously satisfying investigation came to a sudden halt when Holmes faced three particular challenges. The first: figuring out the combination to the victim’s office safe. The second: a two-part stealth challenge where Holmes has to avoid a watchman and his dog. The third: a disorienting timed maze with shifting camera angles (I shudder just recalling it). Silver Earring is a point-and-click (mouse-controlled) third person adventure. 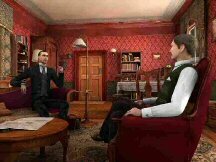 Lots of character interaction, wonderful graphics, terrific recreation of the world of Sherlock Holmes. No sound puzzles, no sliding tile puzzles, one timed maze. Inventory puzzles, observation challenges, a handful of pattern/symbol puzzles, two stealth challenges –- one tough, one even tougher. The game’s story is absorbing. Gameplay is linear in the sense that you must investigate everything in a location before advancing to the next location. Silver Earring was stable except for one crash to the desktop. There are unlimited saved game slots. The background music -- violin and piano -- was pleasant, though by game's end it had grown somewhat tiresome. The game does not allow Holmes or Watson to die (imagine the outcry from the fans!). This game had everything I could wish for in a Sherlock Holmes mystery –- the locations, characters, mental challenges, Holmsian quirks, and a bang-up ending where ALL IS REVEALED. Some parts of the mystery’s explication I had deduced (guessed) correctly –- other parts I had missed entirely, which is just about right for a Holmes mystery. Silver Earring is aimed at gamers who enjoy a good story, mystery buffs, and of course, Sherlock Holmes fans.